The Fried Chicken Biscuit is one of the best things on the menu, which is filled with lots of Southern specialties (pimento deviled eggs, shrimp ‘n’ grits, bourbon chicken livers, onion dip w/old bay chips). This entree comes with a generous portion of fried chicken breast on a warm cheddar biscuit topped with country sausage gravy and onion jam. If you’re watching calories, ask for the gravy on the side, but you’ll probably end up wiping the plate clean it’s that good! Recommend washing it all down with a John Daly, an alcoholic version of an Arnold Palmer (sweet tea, lemonade, vodka and a splash of soda) and, in my option, the perfect summer cocktail. I LOVE everything about Hill Country BBQ. The food is awesome, the atmosphere is relaxed and great for groups, and the live karaoke nights are a ton of fun. Given all of this, I was thrilled to try out their new sister restaurant specializing in fried chicken a few months back. To be honest, while the decor is very cool and the concept original, I was a little bit disappointed with the food here. 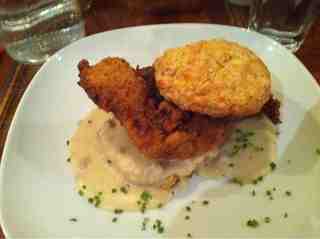 HCC offers two types of fried chicken – the Hill Country Classic and Mama Els’ recipes. 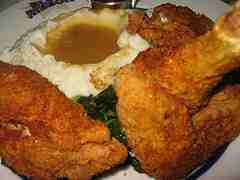 Mama Els is skinless, which to me doesn’t truly qualify as fried chicken, nor does it taste as such. The Hill Country Classic comes with the skin on, but has sugar in the breading, which creates a different flavor that most will not like (I certainly didn’t). 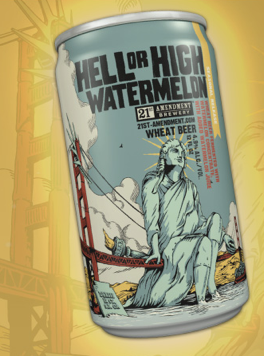 The real reason I have this restaurant on my list of places is because it’s one of the only places in NYC that serves 21st Amendment Hell or High Watermelon Wheat Beer. I am not much of a beer drinker, but this beer is enough to make me consider switching from wine to beer. It’s light, crisp, slightly fruity, and the perfect complement to a fried chicken dinner or any outdoor BBQ fare. You can also find this seasonal release at Whole Foods if you want to enjoy a six pack at home. I always have some in my fridge in the summertime! Blue Ribbon might be best known for it’s raw bar and first-date atmosphere, but it’s also a great spot for good home cooked food. In addition to a fabulous, filling fried chicken entree (it’s big enough for two) that is served with mashed potatoes and gravy and collard greens, the restaurant also serves fried oysters and grilled shrimp remoulade, two more Southern classics. One word of advice on the fried chicken though – it is served with a side of honey which I’d suggest skipping. It detracts from the flavor of the chicken and makes for a messy meal (not so good if you are on a date here!). I stumbled upon this hole-in-the-wall a few years ago when I was serving jury duty downtown. While you won’t find Southern fried chicken here, you will find quick, no frills Korean fried chicken wings and breasts with the slightest hint of sweetness and spice cooked into the skin. The name has changed a few times since my first visit, but the food is still the same. The next time you’re downtown, be sure to check this place out! Images courtesy of http://www.itcamefromnyc.com, http://www.monkeybrewster.com, http://www.cango.com.